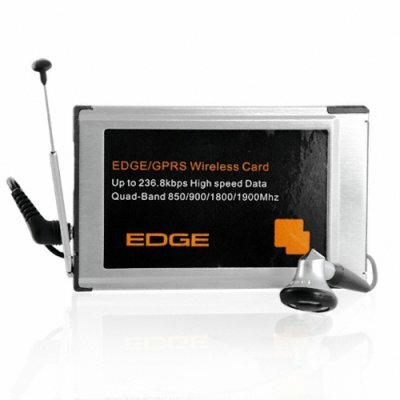 Successfully Added EDGE Quad-Band Wireless PCMCIA Modem - SIM Card Internet Tool to your Shopping Cart. PCMCIA internet connection with SIM card adapter/modem for notebook computers. Never be caught without a high speed internet connection again with this lightning fast EDGE network USB data card. Whether you are a road warrior always needing an on demand wireless connection, looking to bypass overpriced wireless charges in your current location, or simply retrofitting an old laptop computer without a wireless connection, you have made a great choice. This quad band modem provides you with a regular internet connection as well as the ability to still use your SIM card to make and receive phone calls and text messages while you are online. Simply plug into a PCMCIA slot, install the intuitive software and you're ready to surf - easy as that. Always have the internet with you, on the road, in the office, worldwide - wherever there is cell coverage. Works with GSM SIM cards. Your SIM card must not have a PIN number.